If you have a patch of wildness in your soul, it’s in your best interest to listen to it. There are always days when you can stay inside to do arithmetic or run the vacuum cleaner. But a sunny day in November with no obligations–this is a day to tend to the wild soul. Since I am an eldest child with an overdeveloped sense of responsibility, I did not get an early start. 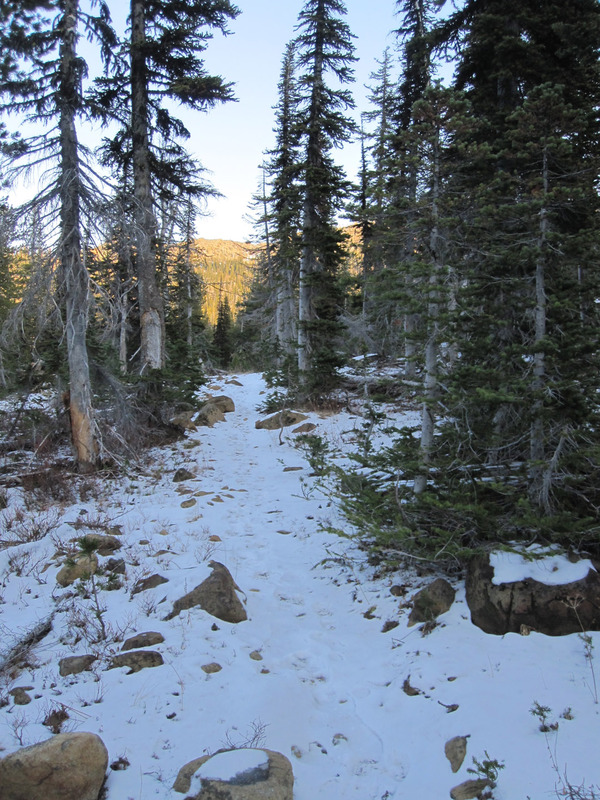 Once I got to the trailhead, I threw on a light pack and carried my notebook in my hand. Chased sunlight up the hill, and finally caught it at the switchbacks on B. Creek. The trail leaves the forest here, and zigzags up a rocky ridge in the open. The creek was partly iced over, evidence that the sun doesn’t penetrate the canyon at this time of year. I’ve always loved the warm tone of these brown rocks. The area is geologically complex–there was once a Teanaway volcano which was the source of basalt and metamorphosed serpentinite. 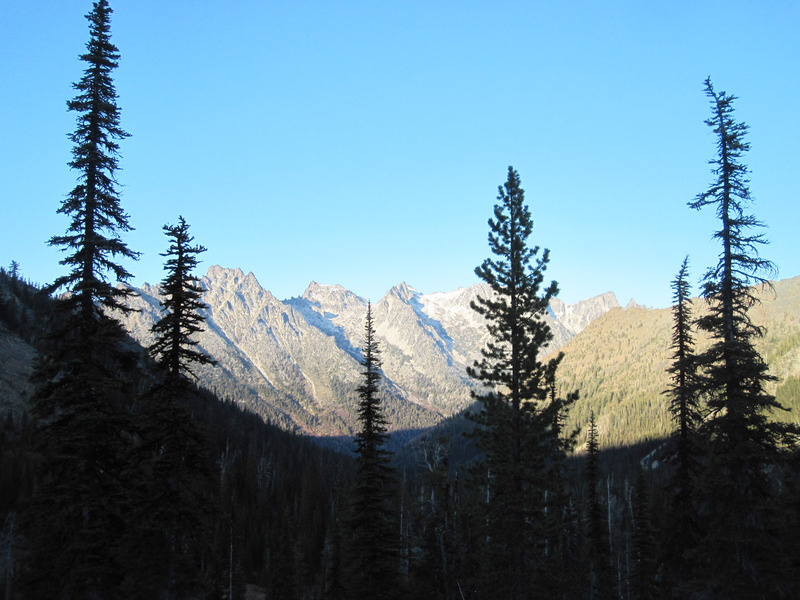 During the last Ice Age, a glacier came down the Teanaway valley. Because the rocks are unusual, so is the soil and the plants that grow in it. This is the only place I have seen these ferns, a kind of Polystichum. 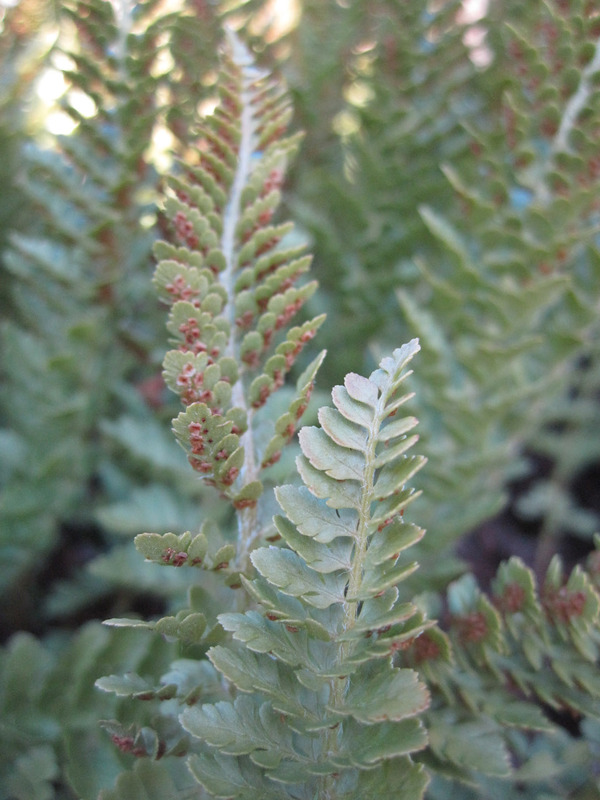 When I moved around to compose photographs, I noticed the spores on each frond. 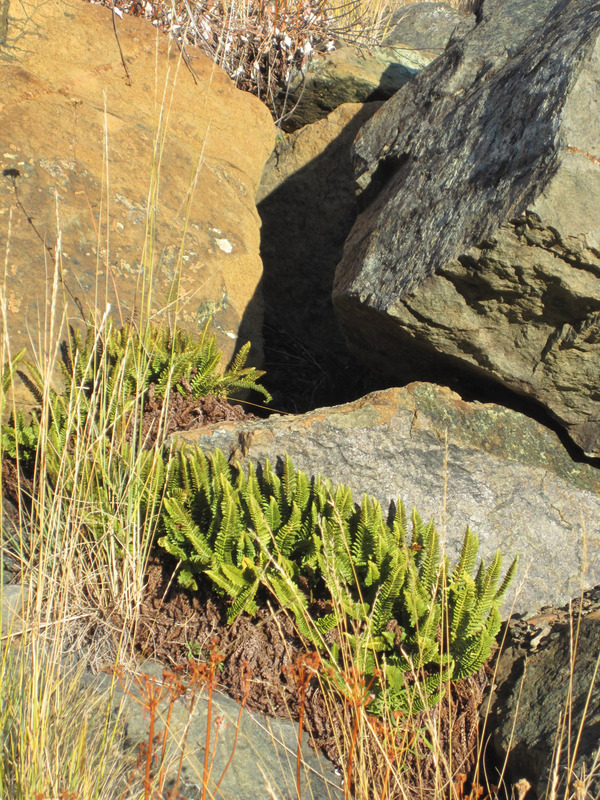 Then I noticed that the ferns tended to grow on the downhill side of the rocks. Of course, that’s where water drains. Not all ferns grow in wet places–this valley is dry, with porous soil. Plants living here need to be able to tolerate summer drought. The reason I wanted to climb the hill today was for this view. I wanted to drop over to the north side of the ridge and look Mt. Stuart in the eye. Maybe this was the last day I could do this and hike on dirt before snow comes. Daylight was already slipping away, and shadows in the valley were deep. 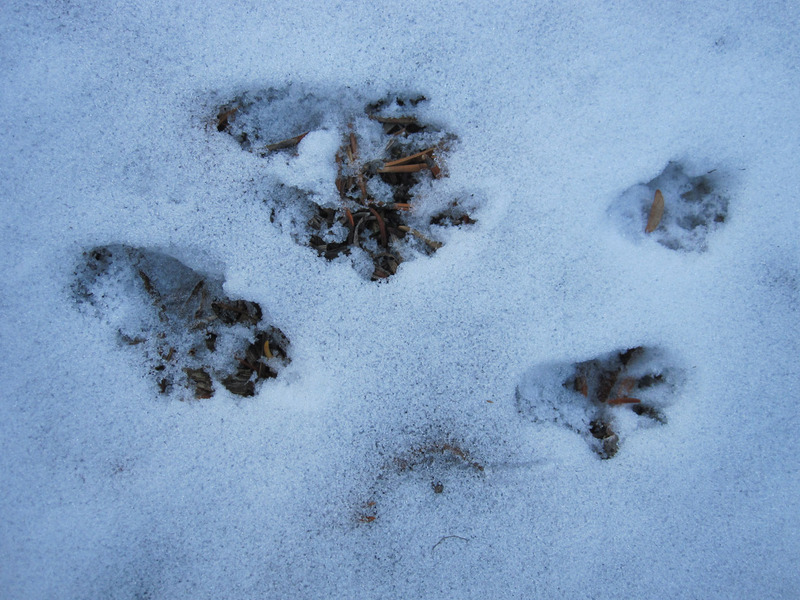 I wandered, boots crunching on the frozen ground. A raven went over–air whiffed through wing feathers, and I saw its head turn to look down at me. I was in the whitebark pine zone, near timberline. Some whitebarks are silver snags, some are adult trees, and some are only a foot high and as gnarled as bonsai. Something in me wanted to keep going, to follow the trail till there were no other tracks, only my own. The snow was dry and cold and squeaky. I heard rockfall. Perhaps a mountain goat or a deer or a wolf. It seemed that there were no other humans around. It felt like I was the only one. I turned back found where a squirrel had bounded across the trail. Hunkered down with my back against a log. Pulled all the clothes out of my pack and put them on, topped off with a warm hat. Scribbled in the notebook and looked up at the changing light. The wind came from the west, the northwest, swaying the trees. A big sound–wind over a ridge through conifers. For years I have been listening for the dialect of different trees, wondering if it’s possible to distinguish between wind in a mountain hemlock and wind in a subalpine fir. I think that it is, but it’s very subtle and I have not been able to find words for the exquisite differences. When I got up to go, shivers were not far off. Time to get the blood moving. I let my feet find their way back down while my mind noticed and wandered, noticed and wandered. It was dusk and my eyes wanted to see things in the gloom that were not there. A whiff of sweetness drifted up the slope from a swath of frost-killed vanilla leaf. Back at the truck I had hot tea from the thermos and drove home with the full moon over my left shoulder. My soul is content. Winter can come now. I planned to just go along for the hike, uncommitted to feeling / thinking / experiencing any particular thing(s). A few steps onto your word trail and I was startled by yet another parallel: eldest, ultra responsible child. There were little shivers of pleasure brought on by sights, smells, sounds & your ponderings. I love the idea of wind-in-the -trees language. I’ll start listening more carefully! Wonderful descriptions. We both felt we were on that hike with you. You surely have a gift and we get to experience it too. Thanks, Deb.